Need a wet weather contingency for your outdoor BBQ event? 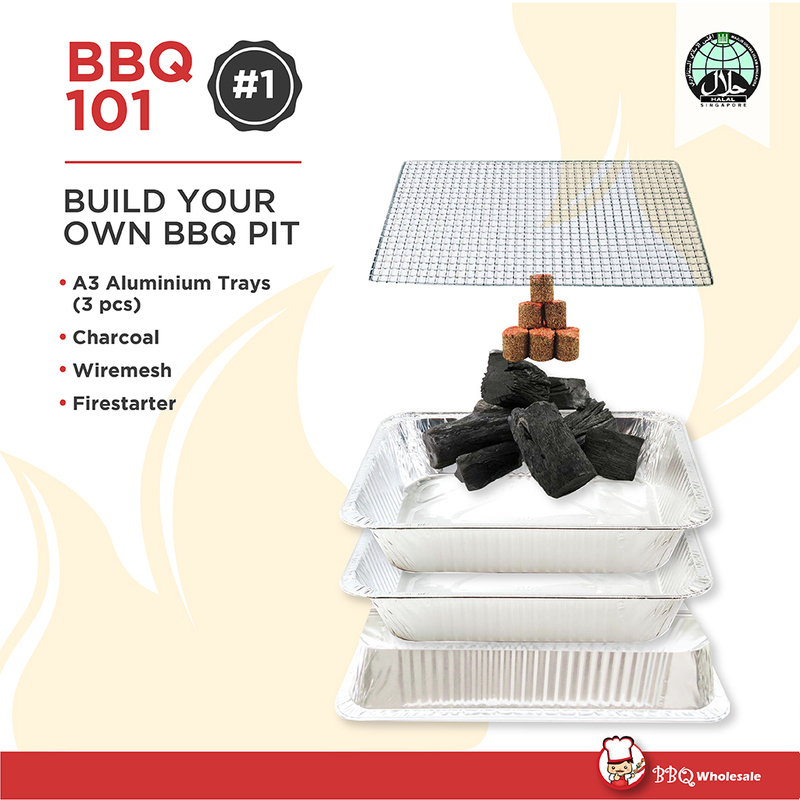 BBQ Wholesale has devised an ingenious method to build a disposable bbq pit using just A3 trays! All you need to do is purchase 3 additional pieces of A3 size aluminium trays for your barbecue event. Each set of disposable BBQ pit is suitable for 6 to 8 hungry bbq guests! It is always good to be prepared for your barbecue party, in the event it did not rain, you may always use the extra A3 trays as trays to hold your food for your guests! Wet weather backup plan is essential, especially if your barbecue event is at a beach or park area. Some of the bbq pits at the park do not have shelter nearby and in the unfortunate event the weather is not in your favour, it is always good to come prepared. After all, you would not want anything to spoil your big event! Combine two (2) A3 trays together and put on top of the makeshift aluminium tray table top. Add charcoal into the aluminium tray and use fire-starter to start barbecue fire. Add wire mesh on top once the charcoal fire starts turning red. Do not pour all the charcoal into the aluminium tray, start off with 1kg to 1.5kg of charcoal. Place fire extinguisher or a bucket of water or sand nearby to put out the fire if necessary. Do not bbq at an enclosed indoor area as it will be very smoky. Only barbecue at an outdoor or outdoor sheltered area. Make sure the disposable bbq pit is on a stable table. Do not place disposable bbq pit on a wobbly surface. If you are using your own table to place the disposable bbq pit; it is always good to protect with it with thick table cover or be prepared to have the table surface damaged. Aluminium tray disposable will be quite hot, please do not touch any part of the aluminium trays. Always stop barbecuing if the aluminium trays are burnt. Question: Can I use A4 tray to build a smaller version of disposable barbecue pit? Answer: Definitely, you may convert an A4 size (standard paper size) to a disposable bbq pit! As the pit is smaller in size, it is more suitable for 2 to 3 guests. Question: Will the charcoal burn out the aluminium A3 tray? Answer: Disposable tray is good for barbecuing for 2-3 hours. Please follow barbecue tips provided above closely. Note: Stop bbq-ing if you find the aluminium tray disintegrating or burnt. Use the prepared water, sand or fire extinguisher to put out the fire if needed. Remember nothing is more important than your own personal safety. Question: Can I save and setup disposable bbq pit using only 2 trays. Answer: BBQ Wholesale does not recommend anything less than 3 aluminium trays. Question: I am quite kiasu, and would like to use more aluminium trays to secure my disposable pit. Answer: Definitely! It is always best to use more than less. Question: How long can I use the bbq pit for? Answer: Use this bbq pit once only. 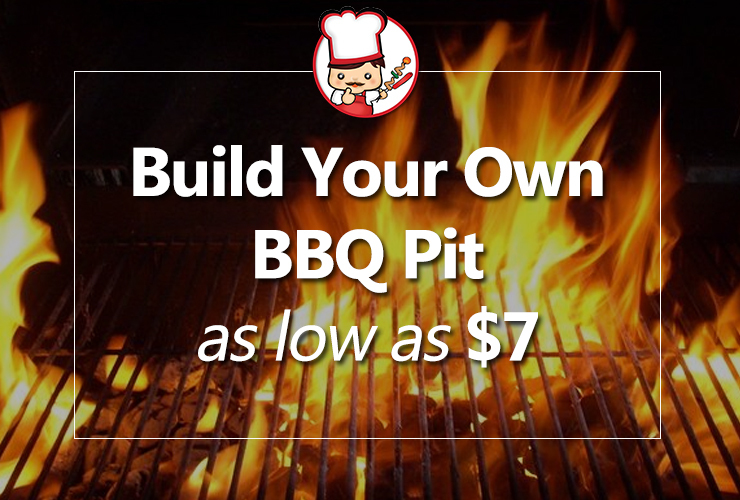 This pit is good for barbecuing for 2 to 3 hours straight. We do not recommend anything longer than this time range. If you’re more of a video person, see below short video on how to assemble a disposable BBQ pit using aluminium trays. Now that you got your wet weather contingency plan covered! It is time to plan your BBQ food menu! 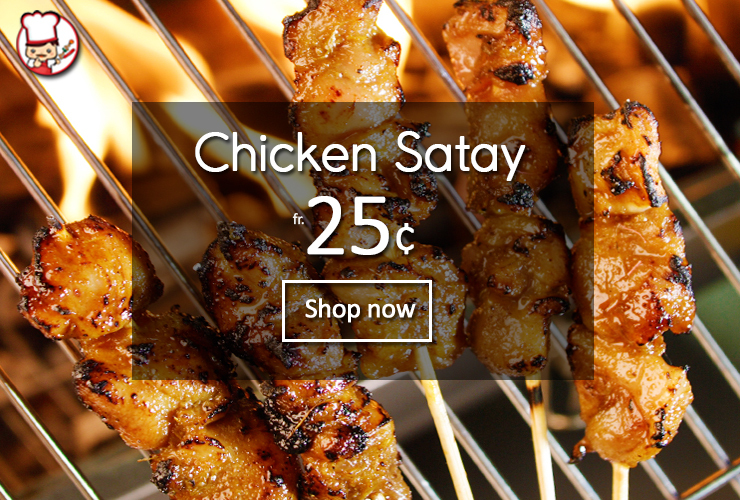 Head on over to BBQ Wholesale online store to buy delicious marinated raw food such as otah, satay, stingray and many more for your barbecue event! We are also halal-certified with vegetarian food in the menu to cater for our fellow Muslim and vegetarian guests!